Ireland [Ірландія] – the second largest island of the British Isles, lying to the west of the island of Great Britain. Politically the island is divided into two parts. Most of the island is occupied by a sovereign state whose official name is Ireland. 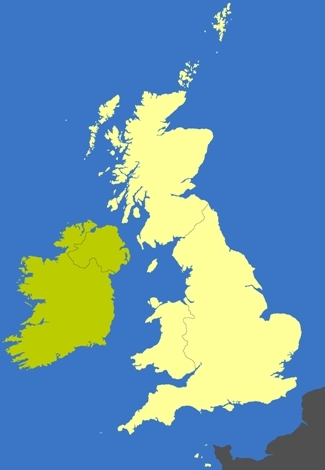 The island’s northeastern part is occupied by Northern Ireland, a constituent country of the United Kingdom of Great Britain and Northern Ireland. The name Republic of Ireland, introduced in 1949 as the description of the sovereign state, is often used to distinguish the latter from the island of Ireland, and from Northern Ireland.